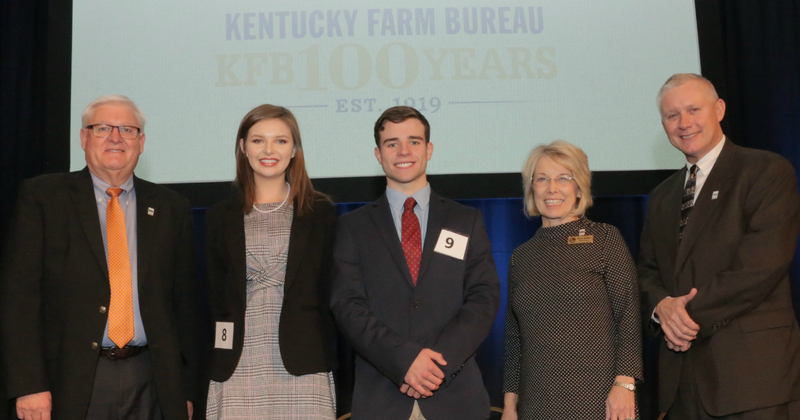 Marcus Wiseman of Clark County and Lauren Rowlette of Madison County were awarded top honors in the 2018 Outstanding Farm Bureau Youth contest held during Kentucky Farm Bureau’s (KFB) 99th annual meeting in Louisville. Mark Haney, President, Kentucky Farm Bureau; Marcus Wiseman of Clark County and Lauren Rowlette of Madison County, Outstanding Farm Bureau Youth Winner, Vickie Bryant, Chair, Kentucky Farm Bureau Women's Committee; Drew Graham, Executive Vice President, Kentucky Farm Bureau Federation. Wiseman and Rowlette were selected from 22 district finalists, 11 male and 11 female, out of approximately 400 young people who competed in county and district contests over the past several months. At each level, the competition consists of two portions: a personal interview and a two-minute prepared speech related to agriculture or Farm Bureau. Contestants are judged by three people with backgrounds in youth work and/or agriculture. During KFB’s annual meeting, judges heard speeches and met with finalists for personal interviews, awarding points for each contestant’s leadership record, conversational ability and scholastic achievement. KFB gave both winners a $2,000 college scholarship, an expense-paid trip to Washington, D.C. on the KFB Congressional Tour in February 2019, a luggage set and watch for winning the contest. Runners-up in the contest were Logan Cheek of Fayette County and Haley Nelson of Shelby County. They each received a $200 cash award and leather portfolio. Congeniality awards, which were voted on by their fellow contestants, were won by Jake Harrod of Franklin County and Gabrielle McLeod of McCracken County. KFB awarded them both with $100 cash prizes for the honor. The 22 district finalists who competed at KFB’s annual meeting included: Gabrielle McLeod (McCracken County), Samuel Freeman (Trigg County), Mallory White (Union County), Samuel Benton (Muhlenberg County), Emma Rose Vincent (Edmonson County), Luke Jacobs (Butler County), Bethany Schalk (Barren County), James Dye (Warren County), Haley Nelson (Shelby County), Logan Cheek (Fayette County), Mary Perkins (Campbell County), Jake Harrod (Franklin County), Molly Sullivan (Taylor County), Hunter Miller (Taylor County), Lauren Rowlette (Madison County), Dylan Driskell (Garrard County), Fielden Bechanan (Nicholas County), Marcus Wiseman (Clark County), Madison Blair (Greenup County), Hayden Osborne (Pike County), Emalee Watts (Breathitt County), and Michael Hensley, Jr. (Harlan County). To view or download the photographs that accompanies this story, click here.